While spatial data analysis has received increasing attention in demographic studies, it remains a difficult subject to learn for practitioners due to its complexity and various unresolved issues. Here we give a practical guide to spatial demographic analysis, with a focus on the use of spatial regression models. We first summarize spatially explicit and implicit theories of population dynamics. We then describe basic concepts in exploratory spatial data analysis and spatial regression modeling through an illustration of population change in the 1990s at the minor civil division level in the state of Wisconsin. We also review spatial regression models including spatial lag models, spatial error models, and spatial autoregressive moving average models and use these models for analyzing the data example. 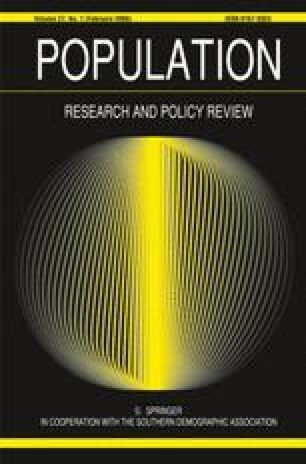 We finally suggest opportunities and directions for future research on spatial demographic theories and practice. We are indebted to Paul R. Voss for his guidance with this research and for providing us with insightful suggestions on earlier drafts. Appreciation is extended to three anonymous reviewers for their many helpful comments. We also acknowledge support from the Social Science Research Center at Mississippi State University and Department of Statistics and Department of Soil Science at University of Wisconsin-Madison. Funding has been provided for this research by the USDA Cooperative State Research, Education and Extension Service (CSREES) Hatch project WIS04536 and the Wisconsin Alumni Research Foundation.